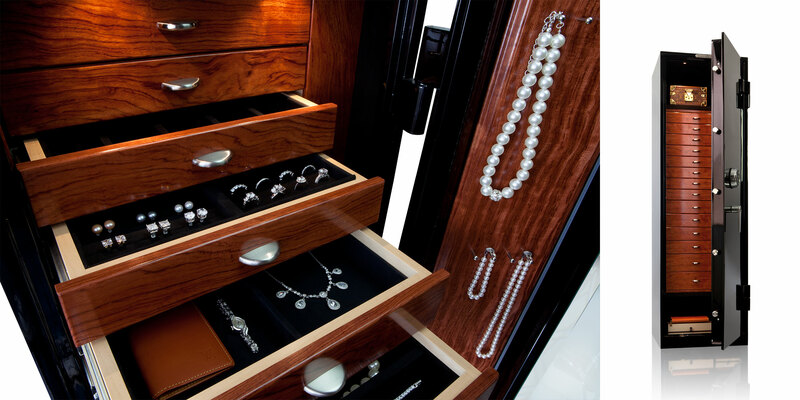 Jewelry Safe - Luxury Jewelry Safes - Brown Safe Manufacturing, Inc. 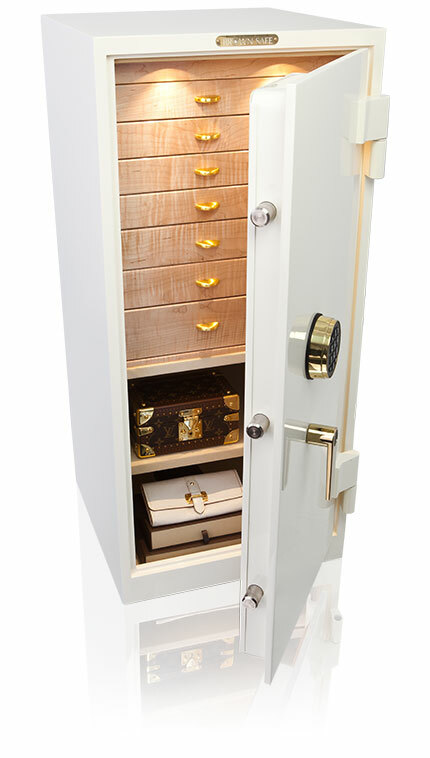 The Gem Series is the most popular line of jewelry safes on the market today. 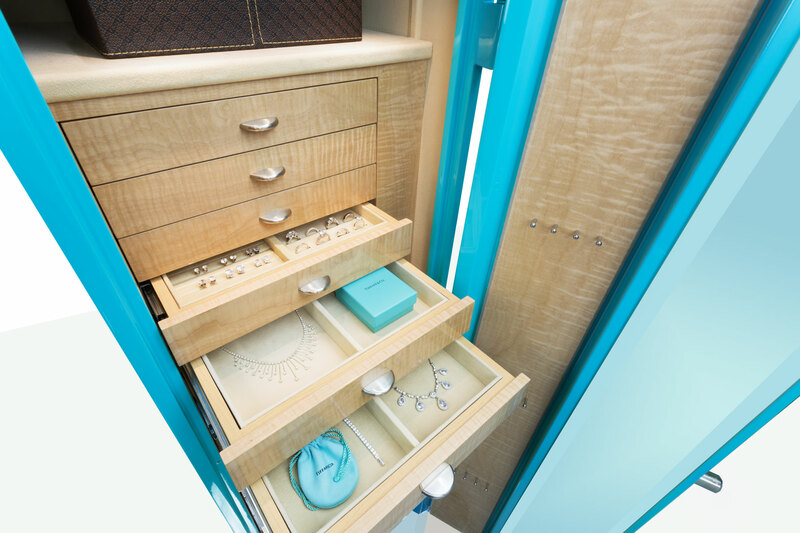 These high-security jewelry safes combine handcrafted jewelry chests with superior mechanical engineering to create the perfect solution to keep your jewelry organized and protected. 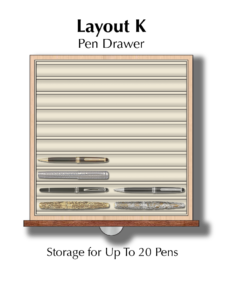 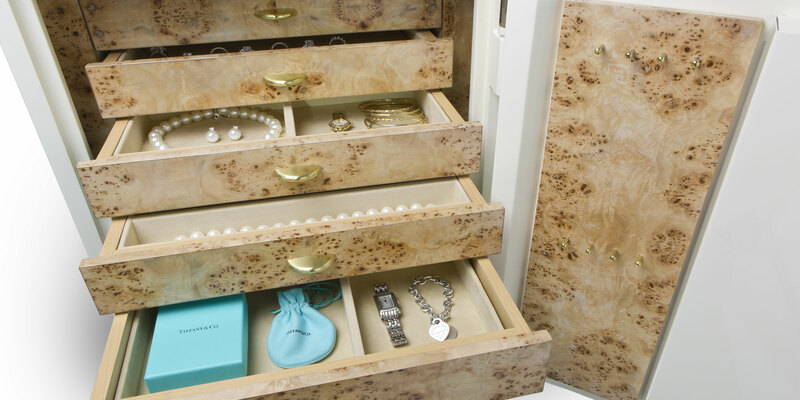 The most convenient and secure jewelry storage solution for those seeking only the very best of the best. 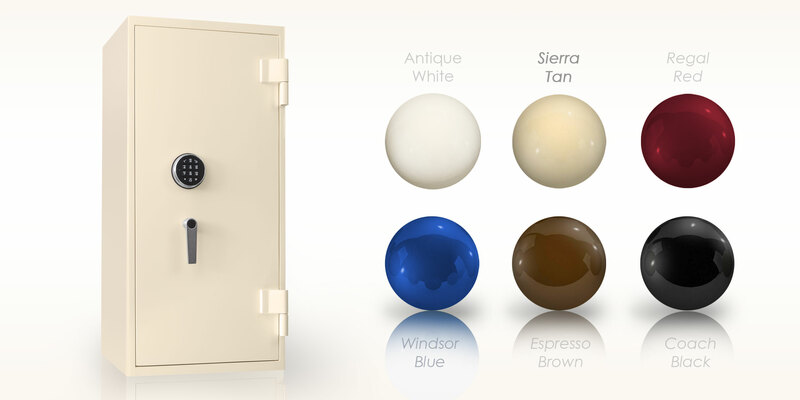 Given Brown Safe’s 35 year history as the leading US manufacturer of high-security safes, and our worldwide reputation for handcrafted quality, a Gem jewelry safe is the ideal solution for organizing and protecting your jewelry collection and valuables. 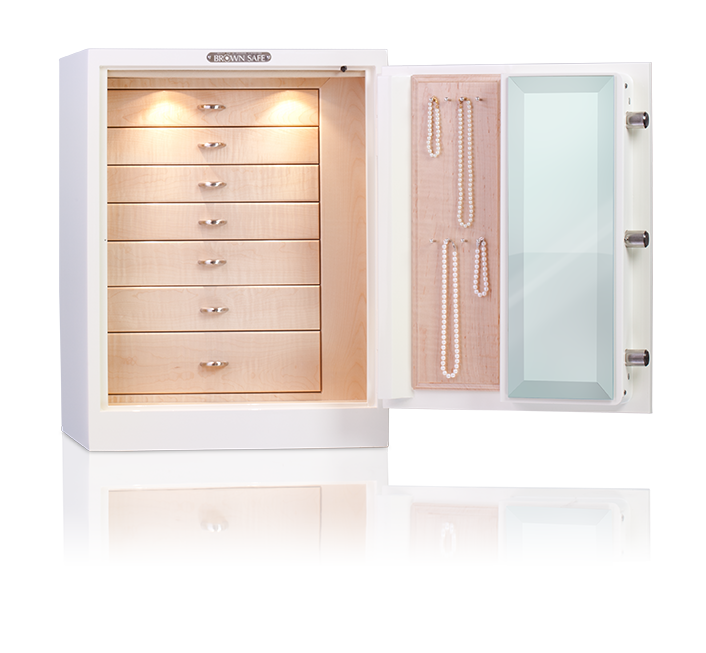 Only the Gem Series by Brown Safe brings you the beauty and luxurious features worthy of your jewelry collection. 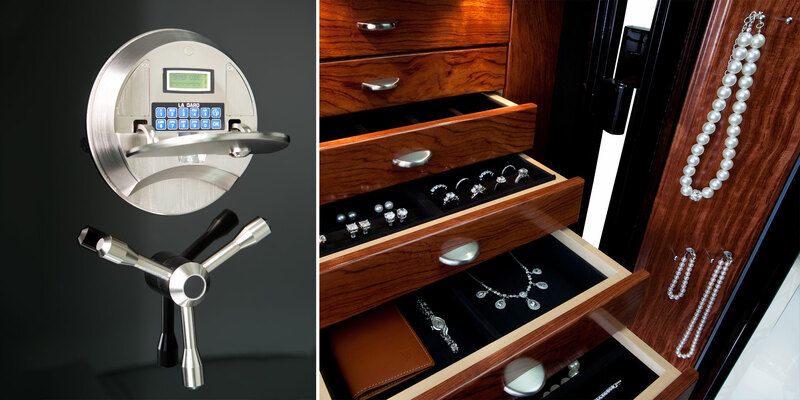 Innovative features ensure your Gem Jewelry Safe is both efficient and an asset to your lifestyle. 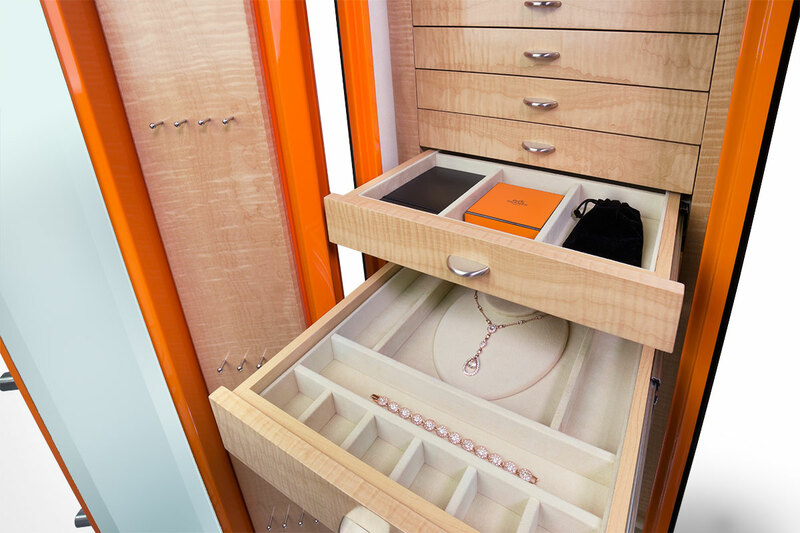 The Gem Series offerings include multiple smartly designed interior features to store and protect all that you cherish most. 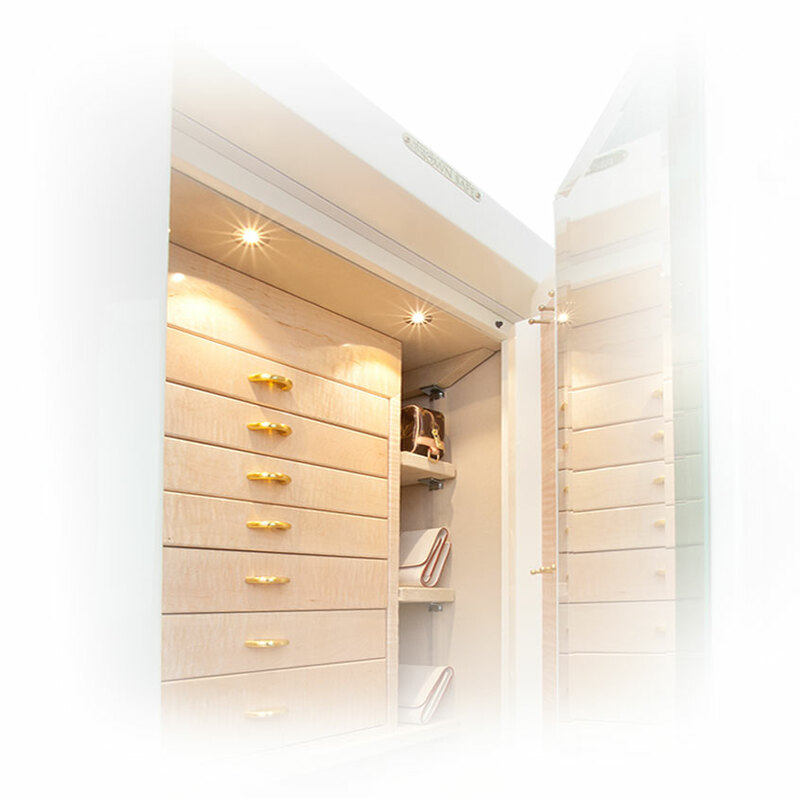 In addition to hand-crafted jewelry chests with soft Ultrasuede lined interiors, we offer automatic LED interior lighting, fingerprint reading entries, customized interiors, and other luxurious features to enhance organization, convenience, and the enjoyment of your jewelry. Conveniently nestled alongside the jewelry safe’s bolt housing, this luxurious necklace rack accents the existing hardwood while making ideal use of free space. For this option an elegant mirror is securely attached to the interior of the jewelry safe’s door, conveniently providing instant feedback while trying on your jewelry collection. All Gem Jewelry Safes can be fitted with watchwinders so your mechanical watches can be kept secure and ready to wear at a moment’s notice. 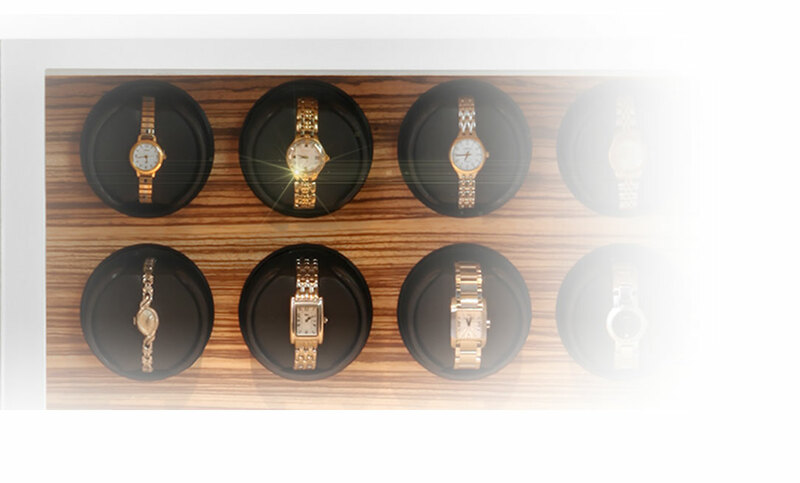 Orbita® automatic watch winders are known for uncompromising quality and reliability. 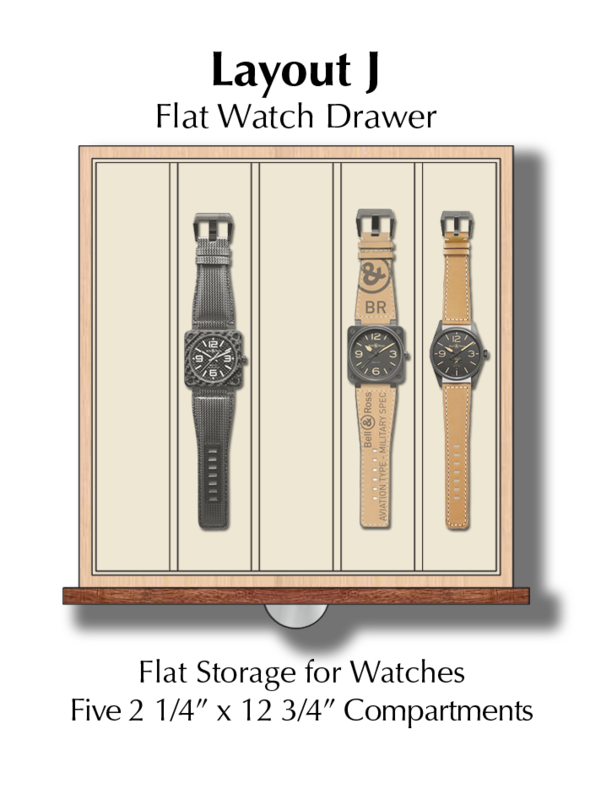 Their winding technology is recognized and acknowledged by both watch manufacturers and watch collectors all over the world. 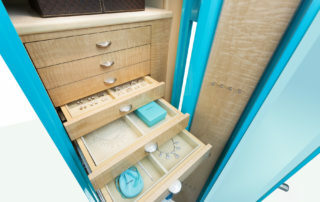 Produced by Hera for years of trouble-free illumination, these low profile lights cast a soft neutral illumination throughout the jewelry safe interior, enhancing the natural beauty of the hardwood drawers and trim while establishing a vibrant luster for the jewels within. 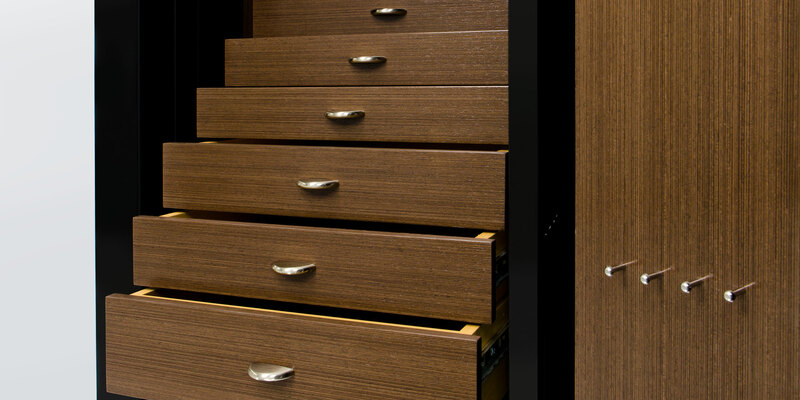 All interior surfaces and drawers are lined in your choice of luxuriously soft velvet or Ultrasuede. 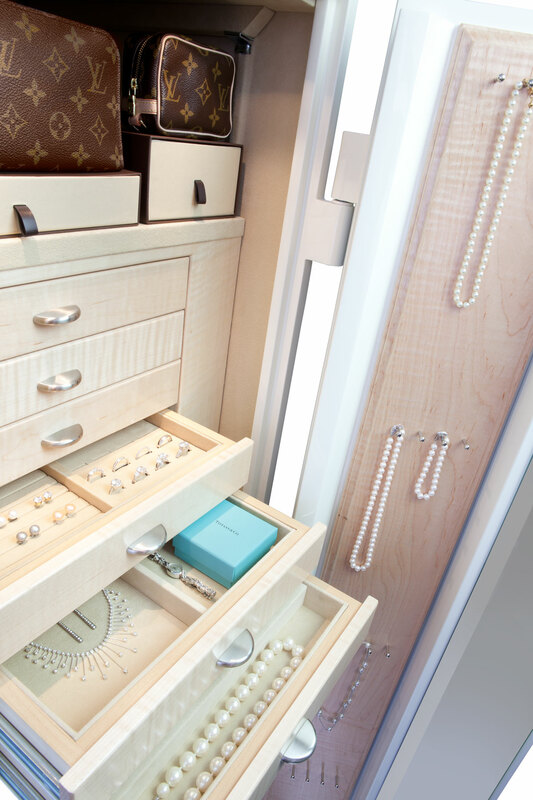 No other jewelry safe delivers the vast array of standard paint finishes, wood types, interior fabric colors, and hardware options. 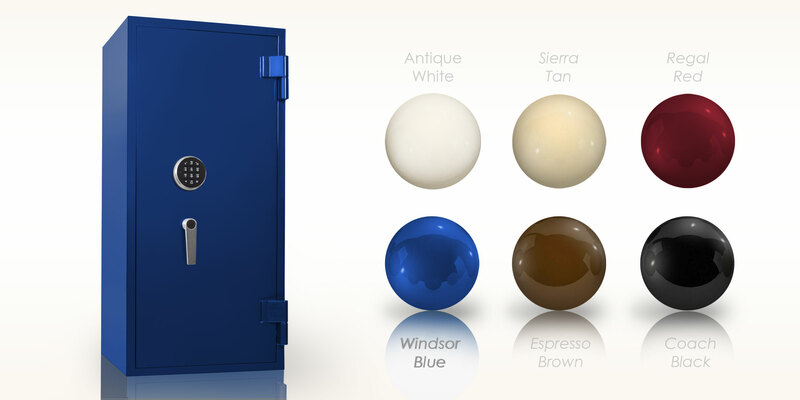 Exterior Color Selection All Gem Luxury Jewelry Safes undergo a multi-stage paint process to give the most refined exterior finish available, resulting in a hardened paint finish which is then polished to a high gloss. Need a Custom Paint Finish? 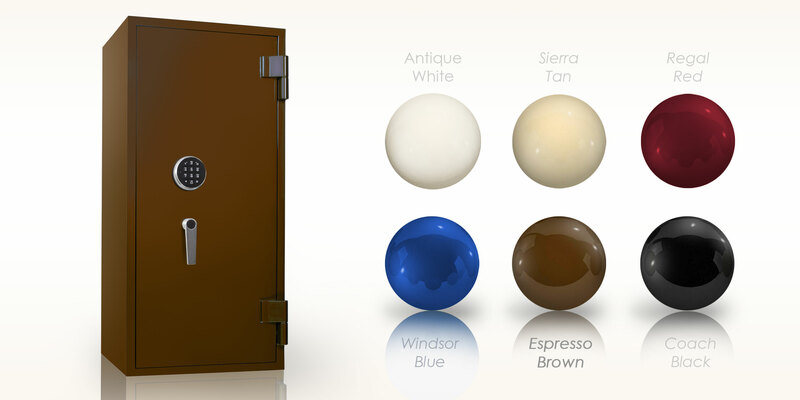 Our in-house painting experts specialize can also color match to multi-stage paints. 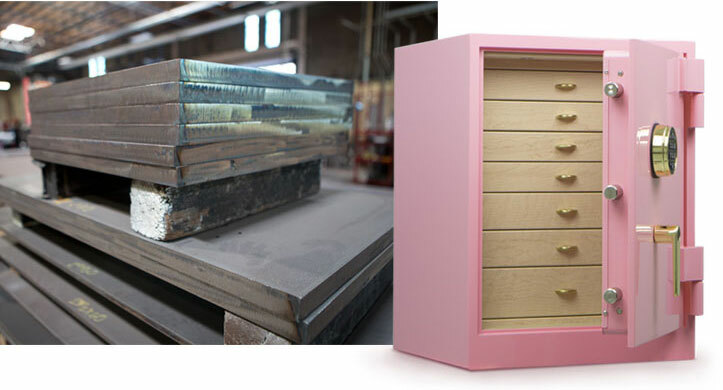 Simply provide a sample, and we’ll match the safe. 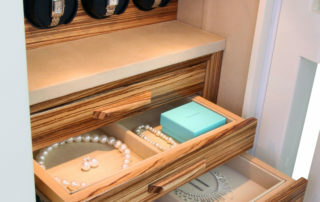 The jewelry drawers, necklace rack, and interior trim in all Gem Luxury Jewelry Safes are custom-built using our hand-selected stock of hardwoods. 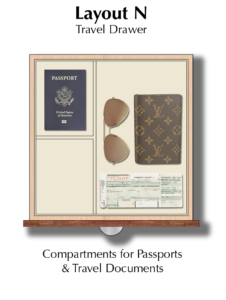 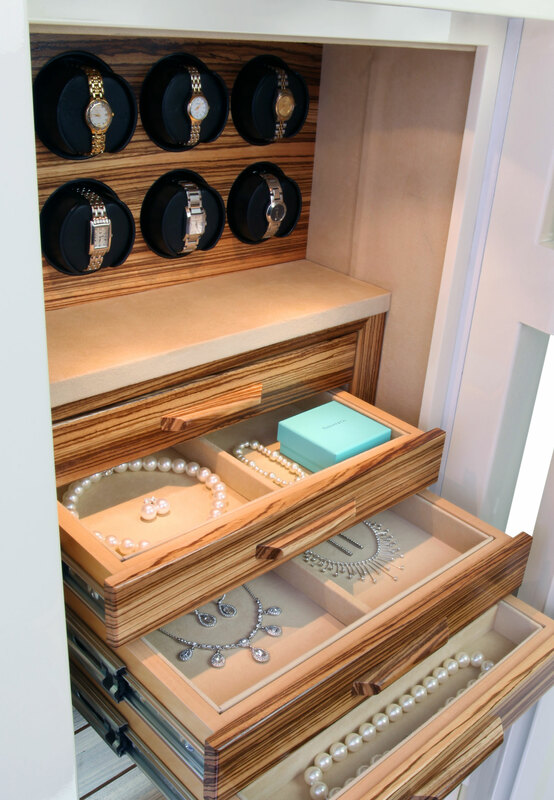 Choose from eight premium hardwood types to adorn the interior of your luxury jewelry safe, or if you have a different look in mind we can accommodate custom wood finishes and procure additional material types. 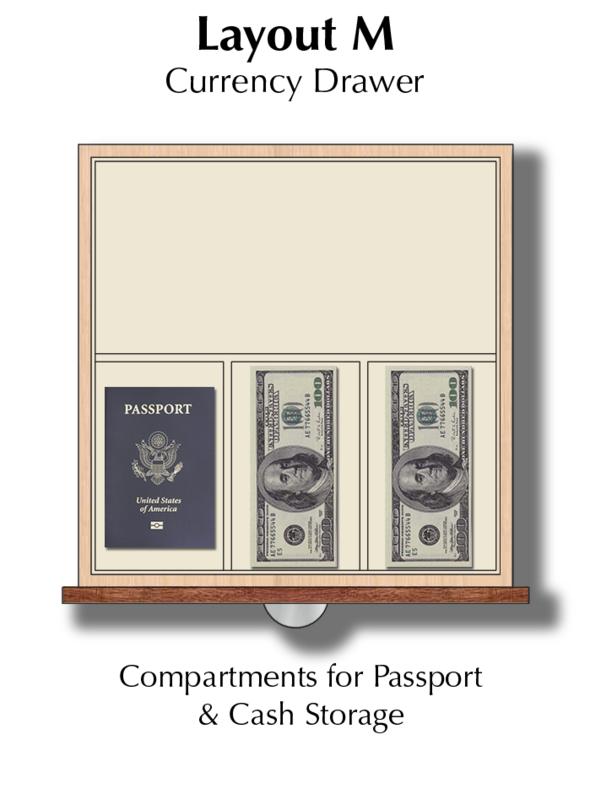 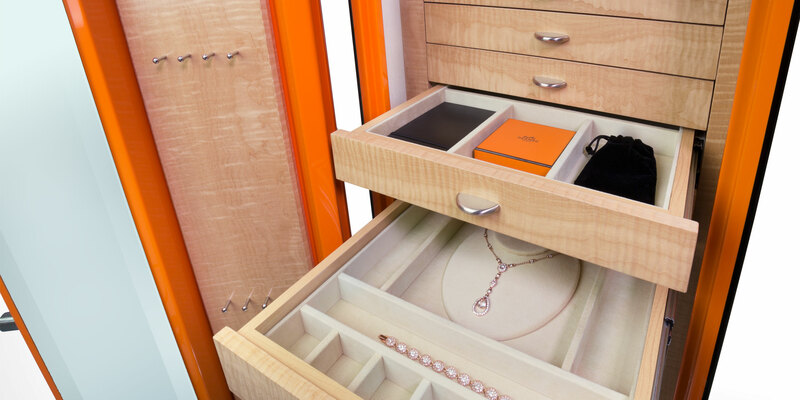 The entire interior of all gem models are lined in your choice of soft velvet or luxurious Ultrasuede® to create a beautifully finished product, and by lining the shelves and interior of the drawers we create a soft surface that won’t damage delicate jewelry and treasured valuables. 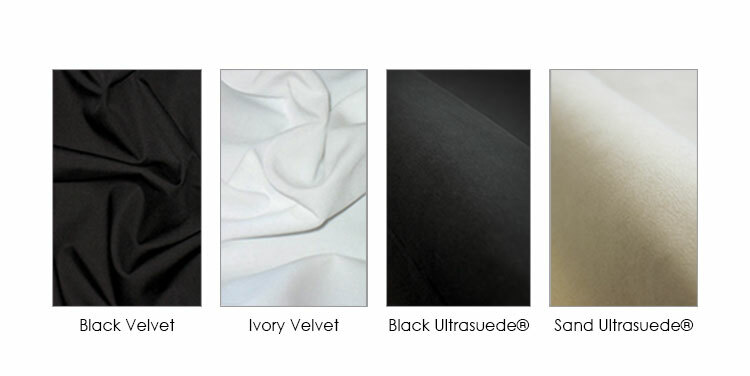 All interior walls, shelving, and drawer inserts are lined in your choice of lush velvet fabrics in black, gray, and ivory, or the option to upgrade to luxuriously soft Ultrasuede® in black, sand, or a host of custom color options. 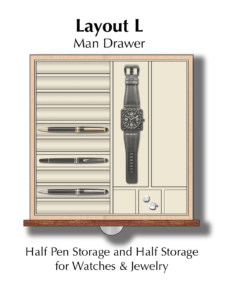 To further customize the look of your jewelry safe and compliment your personal style the Gem Series is offered with your choice of three hardware finishes to adorn the lock enclosure, handle, and interior hardware. 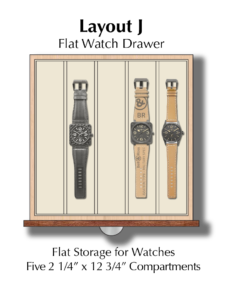 Select the rich warmth of brass, clean and contemporary brushed stainless, or the deep luster of oil-rubbed bronze. Mix and match finish options to create a jewelry safe that is all your own. 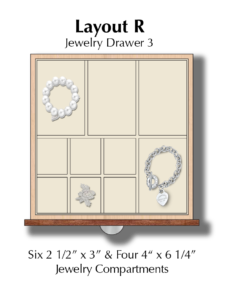 With the Gem Jewelry Safe all you favorite pieces are in one convenient location, easily accessible all at once, delivering a hassle-free experience while searching for the perfect ensemble. 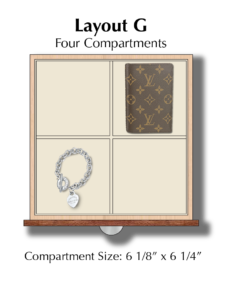 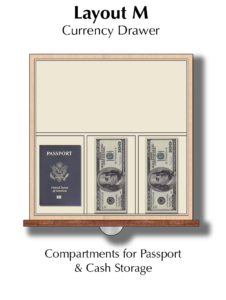 Finally all your valuables can be securely protected easily and easily organized. 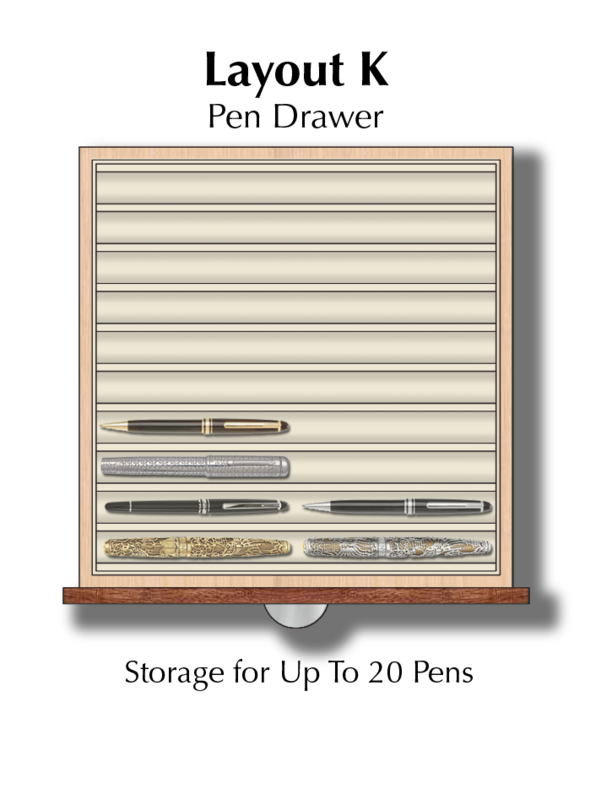 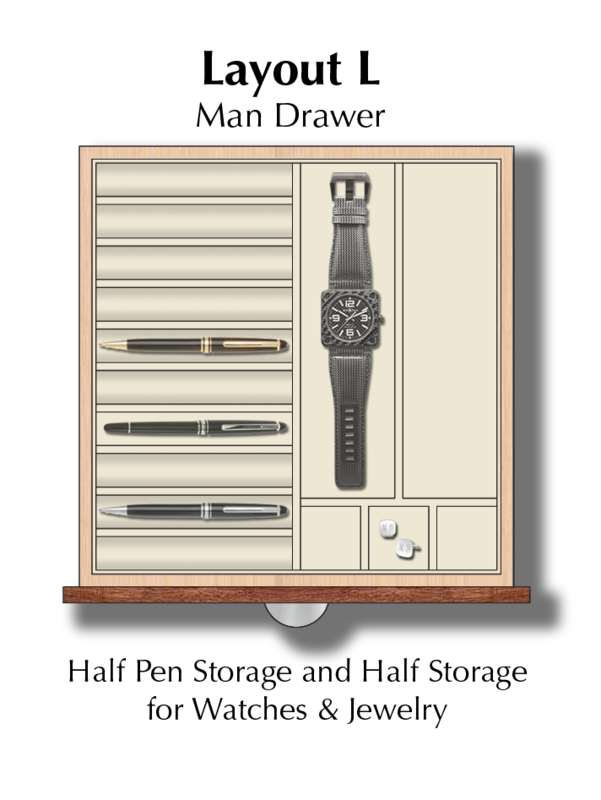 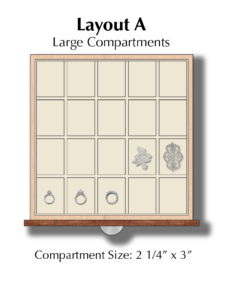 Select from 18 interior drawer layouts thoughtfully designed for convenient storage of specific jewelry types. 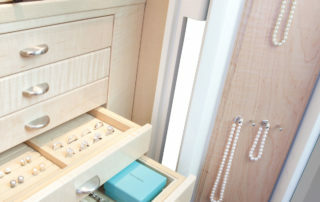 Convenience is a key component to a luxury jewelry safe, and the Gem Series has been designed to incorporate all of the necessary features one would want to securely organize their valuables while maintaining ease of use – including a simple and secure means of gaining entrance. The ideal lock for the traditionalist. Its beauty is only surpassed by its simplicity. 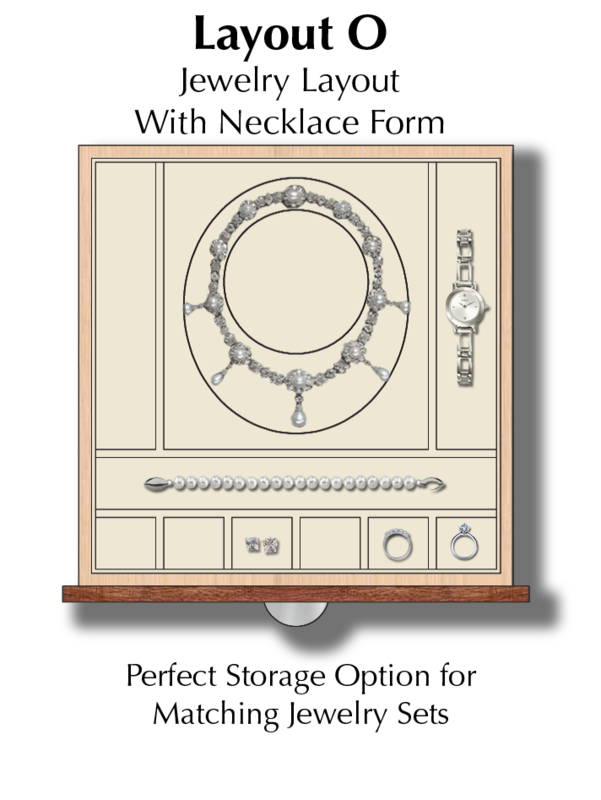 Untouched by time, this dial will turn with the same effortless fluidity in one hundred years. 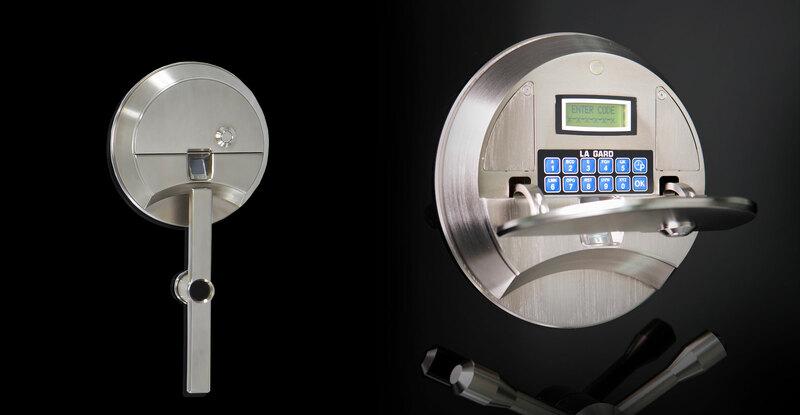 Also, available in a Key Locking model which places a keyhole at the center of the dial and gives the user the option of locking out the dial. 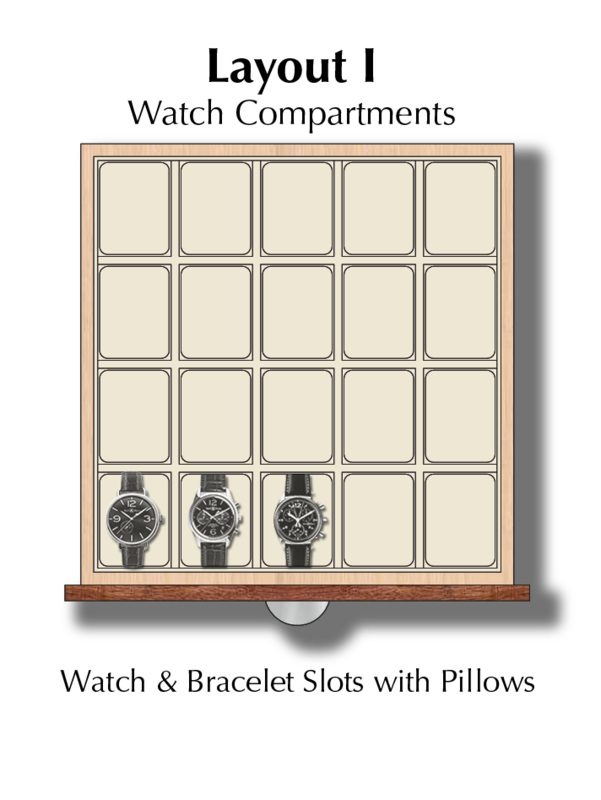 Once locked out, the dial will not function until the key is reinserted. 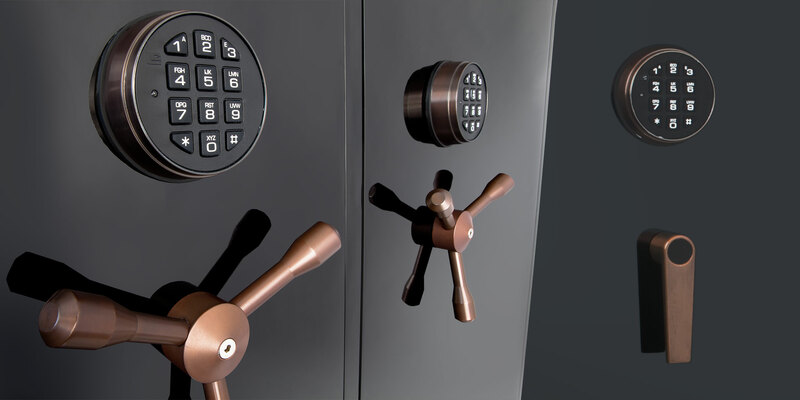 The keypad is our most popular lock due to its simplicity and ease of use. 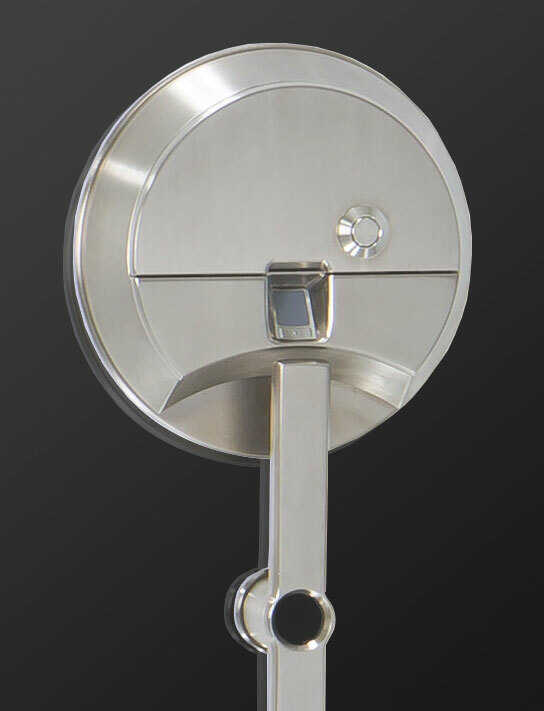 This industrial grade lock comes from La Gard, one of the most reputable lock makers in the industry. The model we use has proven it’s worth over many years of both commercial and residential service. 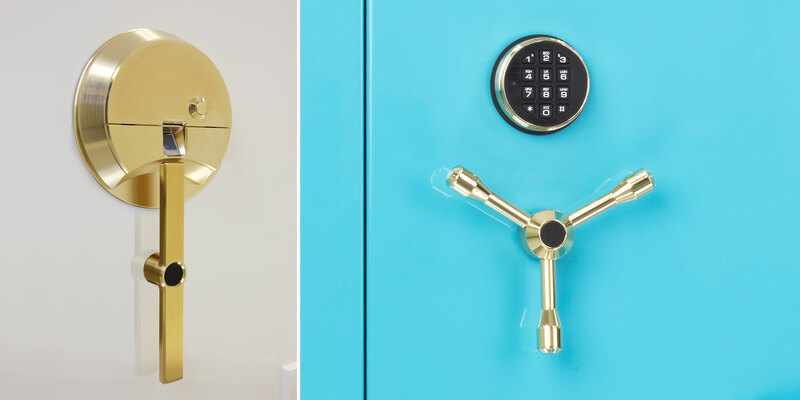 This luxury lock offers the ultimate in security and ease of use. No compromising combinations to remember, simply touch and open. 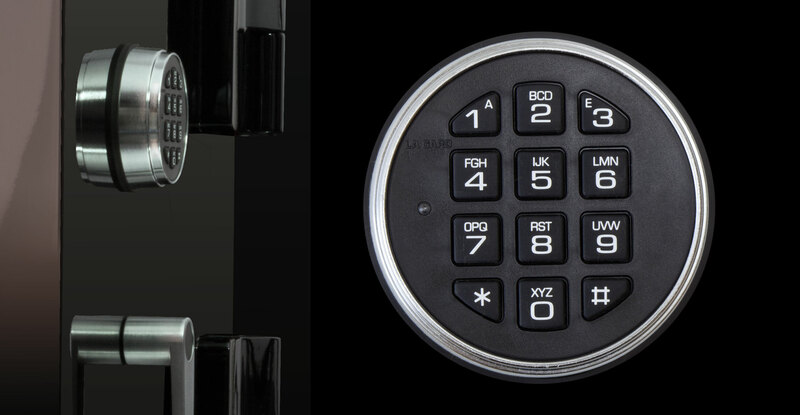 The fingerprint lock comes embedded in a beautiful and rugged casing with matching handle. 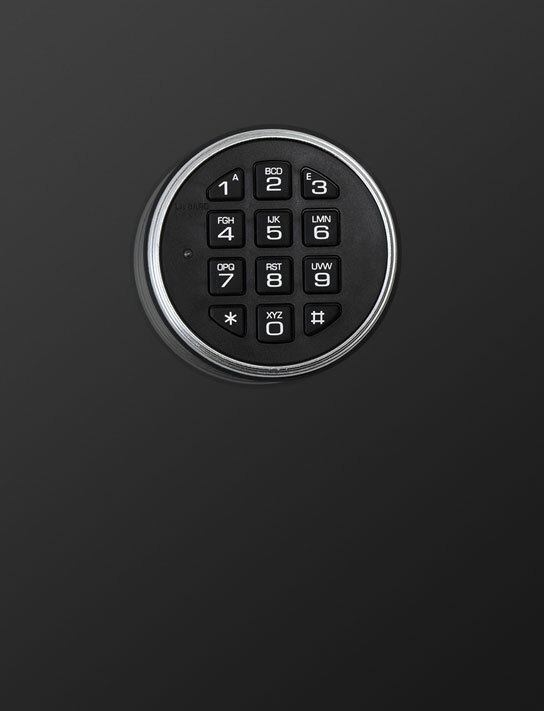 This industrial-grade casing provides increased outer lock protection while the top nested ergonomic position of the biometric fingerprint reader allows for effortless access. There’s simply no substitute for solid steel. 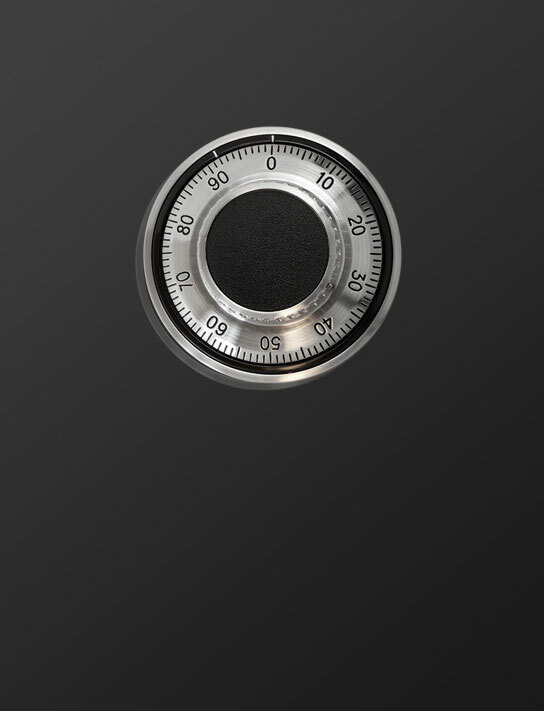 Truly dependable protection tailored to your needs. 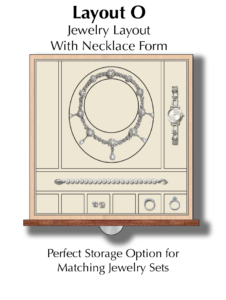 The Gem Line of luxury jewelry safes offers the most advanced materials and methods of construction to bring the superior protection only a Brown Safe can deliver. 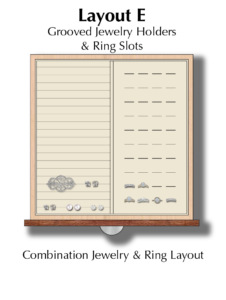 Gem Series jewelry safes are available in four protection rating levels, offered with or without fire protection, to provide the perfect security solution for your individual needs. 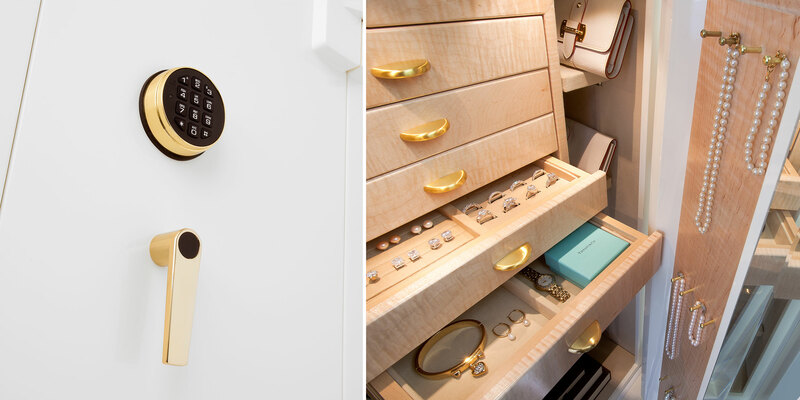 Protecting your valuables has been, and will always be, our number one priority. 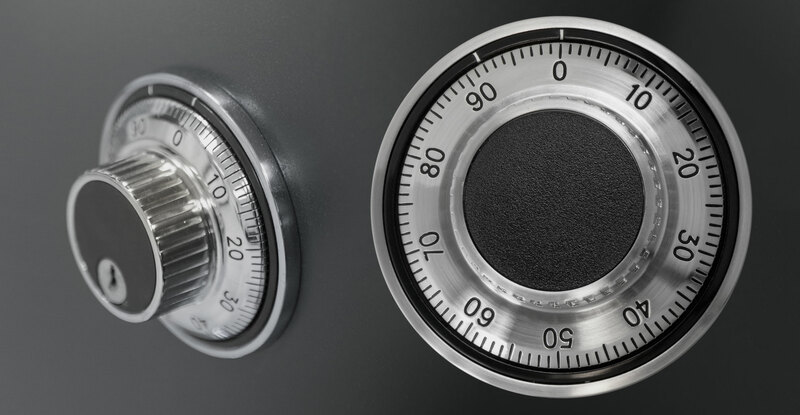 Our dedication to this core value has earned Brown Safe an industry-wide reputation for building the most secure safes available anywhere. Select a Gem Jewelry Safe model to begin designing your own custom safe or shop our preconfigured models.